With the holiday tournaments over, the college basketball season is hitting high gear and individual games – not tournaments – are the must-see events. Led by the ACC/Big Ten Challenge, this week is loaded with several top-notch battles and plenty of games between teams we could see in the NCAA Tournament come March. Monday saw a nice comeback by Virginia over Minnesota, but Tuesday is when the week really kicks off. Georgia Tech at Northwestern (Tuesday): Georgia Tech struggled at the outset, but its perimeter-oriented lineup has bounced back. Northwestern and John Shurna will be in the mix. Boston University at Kentucky (Tuesday): Boston University was the America East favorite, but the Terriers won’t have nearly enough for Kentucky. Mississippi at Miami (Fl.) (Tuesday): Both of these teams have had their ups-and-downs so far this season, although neither was expected to be in the Big Dance. Ohio State at Florida State (Tuesday): One of the best games of the week, Florida State’s big and experienced frontcourt will be a contrast to Ohio State’s deep and talented perimeter. Georgetown at Missouri (Tuesday): This game will be a contrast of styles, with Georgetown’s Princeton-esque offense and Missouri’s “Fastest 40 Minutes” up-tempo style. North Carolina at Illinois (Tuesday): Both teams might have been somewhat overrated at the outset after not making the NCAA Tournament last year. A win here would go a long way. Long Beach State at Washington (Tuesday): A West Coast battle between one of the Big West’s contenders and the Pac-10 favorite. Washington had some offensive struggles in Maui. East Tennessee State at Dayton (Wednesday): ETSU was one of my mid-major sleepers before the season, but it is struggling right now. Dayton has been a huge question mark. Florida at UCF (Wednesday): Intrastate battle between an established program and one on the rise. UCF is undefeated this season; could it knock off the Gators and pick up in-state supremacy. VCU at South Florida (Wednesday): VCU impressed a lot of people with its performance in the NIT Season Tip-Off, while South Florida has been up-and-down so far. Richmond at Old Dominion (Wednesday): Another intrastate battle, this one between private schools in Virginia. Will Kevin Anderson and Kent Bazemore be matched up with one another? Indiana at Boston College (Wednesday): This game might not stand out on paper, but Indiana is 6-0 right now and Boston College has shown some potential with a win over Texas A&M. North Carolina State at Wisconsin (Wednesday): One of these programs consistently underachieves, while the other is constantly underrated. NC State has more talent, but Wisconsin is better coached. Purdue at Virginia Tech (Wednesday): This game looked a lot more attractive before Robbie Hummel suffered another injury and Virginia Tech struggled mightily. With that said, Malcolm Delaney and E’Twaun Moore will be a great match-up. BYU at Creighton (Wednesday): BYU had a couple of great escapes in the last week, and Creighton will not be a pushover. Will Jimmer Fredette need some more late-game heroics? Western Kentucky at Vanderbilt (Wednesday): Both of these teams have gotten off to interesting starts, and should have a nice battle. WKU has NBA prospects in its frontcourt; Vanderbilt has solid balance. Maryland at Penn State (Wednesday): Not the best of the ACC/Big Ten Challenge games, but Penn State has a guy who can carry them in Talor Battle. 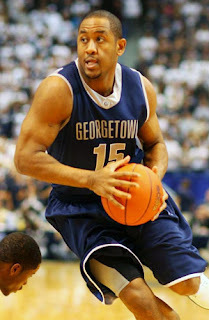 Jordan Williams should dominate down low. Michigan State at Duke (Wednesday): Had Michigan State not lost to Connecticut last week, this would be a battle between No. 1 and No. 2. The Spartans have some kinks to work out; Duke is rolling. Saint Mary’s at San Diego State (Wednesday): A very underrated game between two of the best teams on the left coast. San Diego State’s big-time frontcourt will be tested by SMC’s terrific backcourt. Arizona State at Baylor (Thursday): Not surprisingly, Baylor has really taken a step forward with the return of Lace Dunn from suspension. Arizona State nearly won the Great Alaska Shootout. UCLA at Kansas (Thursday): Two of the greatest programs of all-time will do battle, although Kansas has been one of the more impressive teams in the country, while UCLA has struggled. Missouri at Oregon (Thursday): Another chance for Missouri to show off its “Fastest 40 Minutes” against a thin and inexperienced Oregon team. This one could get ugly.